Imagine missing out on this view? Thanks to the glass paneling such unobstructed views can be enjoyed without compromising safety. For swimmers at the Infinity Pool, Sky Park, Marina Bay Sands such an impeccable view wouldn’t have been possible without a Glass Pool Fencing. As the glass industry grows, options for and types of glass installations are infinite. There are glass installations in showers, balconies and bedrooms. And now, you can enhance the appeal of your swimming pools with Frameless or Semi Frameless Glass Fencings. Safety should never be compromised and that holds especially true for swimming pools. A fencing helps clearly demarcate the pool area and can pre-empt the possibility of falling and drowning accidents. It also helps the other areas of your property to remain dry and water free. A varied level of opacity and translucence are available. There is 100% visibility. Depending on the privacy requirement needed for the swimming pool, you have the flexibility to install the paneling with clear laminated Glass or adding some opacity with Frosted or Tinted Glass. Glass has become a versatile product when it comes to interior designing. It gives a feeling of openness and space, besides the flawless, sophisticated look. Flexibility with the glazing works be it glass cutting, etching or frosting offers much room for customizations according to one’s preference. Glass pool fencing is usually made from 1/2” inch tempered glass. This makes it six times stronger than normal glass. Virtually unbreakable. Tempered glass and stainless steel clamps are both very resistant to corrosion and wear. They take less space too. Proper installation can last a lifetime. Unlike its counterparts, wood and metal, glass fencing just needs a loving hand. Some soap and water, a magical touch of this combination and you have a sparkling clean Glass Wall. Glass is also resilient to the elements of nature, so come rain or shine there’s no worry of discoloration and fading. 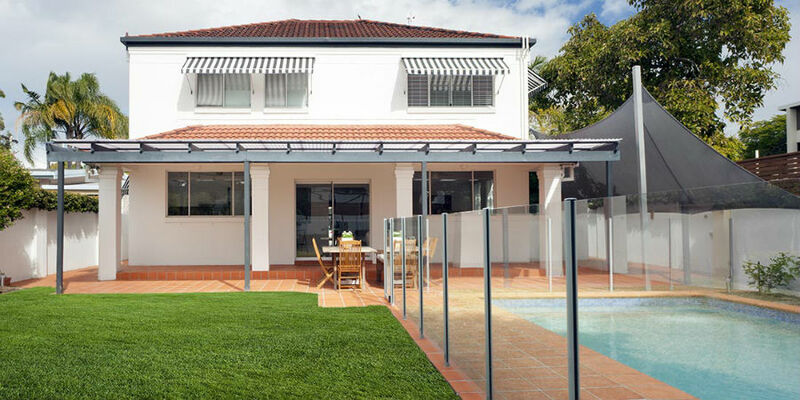 It is advisable to call professionals for installing Glass Pool Fencing. An expert Glazier will complete glass paneling tasks with efficiency and safety, depending on the size of the pool. Swanky pool fencings can get ready within a day if the glass fittings are perfect and so is the glazier. Glass panels are made to order, size and choice, thus research and expert advice is recommended for your ultimate contentment. While Glass pool fencings may cost a bit more than wooden and metal fencings. But they are permanent and add to your property’s valuation. Doing it right with a slightly higher budget for once is a better idea than compromise with alternative materials or even having to redo again in the future. 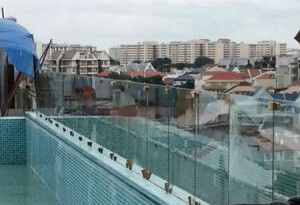 An example of how Glass pool fencing is the next best thing for your yard and swimming pools. A few Bungalows near Holland village ooze simplicity and smart choices. Glass Pool Fencing is one of them. Add sizzle and style, do not fret over dollar and dime, The house is your heaven, let the glass make it shine!